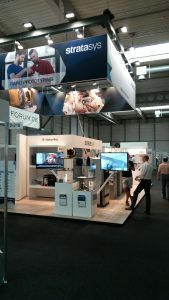 Rapid.Tech is always one of the highlights of the 3D printing calendar, with participants from more than 200 exhibitors and 4,800 visitors travelling to Germany to take part. Naturally the RP Platform team were once again in attendance for the 2017 event. In spite of the sweltering heat (thanks to a lack of air conditioning in the venue! ), it once again proved to be an enjoyable and informative few days, with the various exhibitions and talks promising great things for the AM sector in the near future. We were very impressed with the variety of new desktop-size printers on display, particularly those designed with industrial applications in mind. With designs suitable for both curious hobbyists and seasoned professionals, there’s never been a better time to begin exploring AM. With more and more companies looking to bring their 3D printing projects in-house rather than outsourcing them, the growing variety of printers available will make this process both attractive and achievable for a wide range of industries. Metal printing has been slowly but surely establishing itself as a serious tool for both prototyping and production in recent years. This trend showed no signs of diminishing throughout the whole Rapid.Tech weekend. 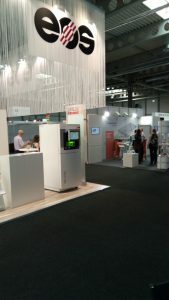 We saw more and more companies exploring metal printing for a wide range of applications, and an impressive variety of new technology and materials on display. If this — and the ongoing research taking place in the automotive and aerospace sectors — is anything to go by, this technology is definitely here for the long term. We’re pleased to report that all speakers were of the calibre we have come to expect from Rapid.Tech. We especially enjoyed the keynote speech from the venerable Chuck Hull, creator and ongoing champion for 3D printing. It was great to engage directly with companies who’re working at the cutting-edge of 3D printing, in terms of technology, processes and applications. We made a lot of valuable contacts who we’re looking forward to collaborating with in the future. We’ll see you at Rapidtech 2018!